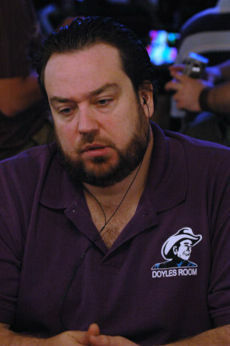 Todd Brunson is the son of the legendary Doyle Brunson and was born on August 7, 1969. Despite having a legendary poker player for a father, the first time Todd Brunson ever played poker was when he accompanied his father to Australia shortly before he went off to college. He played poker a lot during college, and eventually dropped out to become a professional poker player instead of continuing on to law school like he had planned. Todd Brunson had almost immediate success, as he won the Diamond Jim Brady poker tournament at the Bicycle Club in Los Angeles when he was 21, earning $200,000 for his victory. Since then, he has had a tremendous amount of success in both poker tournaments in high stakes poker cash games. He once won $13.5 million in two days during a heads-up $50,000-$100,000 Limit Holdem game.Todd has appeared on Poker Superstars II, where he lost to Johnny Chan in the Grand Final, and Poker Superstars III, where he defeated Antonio Esfandiari in the Grand Final. Todd has also appeared on the Ultimate Poker Challenge and High Stakes Poker. Todd Brunson won his first bracelet in the 2005 World Series of Poker $2500 Omaha Hi-Lo Split event. This victory made Doyle and Todd the first father-son combination to win bracelets at the WSOP. They are also the first to do it in the same year, as Doyle also won a bracelet in 2005.